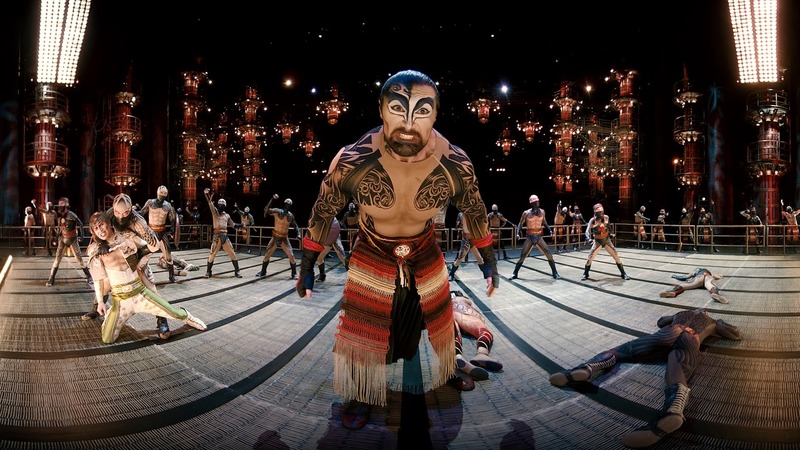 Experience Cirque du Soleil like you’ve never seen—or felt—before! is a first wave kind of company." 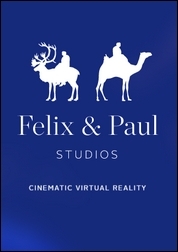 Felix & Paul Studios is the world’s only full spectrum VR studio, showcasing end-to-end creative and technological know-how and proprietary tools within one company—including best-in-class spherical 3D camera systems, production and post-production software and processes, and specialized audio capture, design and processing. "Because the technology is so young, my team approached it with caution," says Méthé. "Rather than investing huge amounts of capital upfront, we partnered with Samsung, creator of the virtual reality device, and Felix & Paul Studios in Montreal, which created the special camera used for recording the experience, and approached the endeavor as a team. 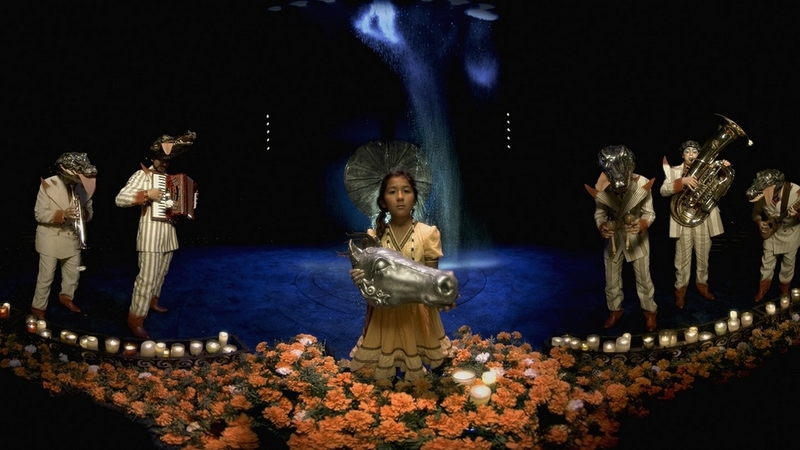 We’re just at the beginning of exploring new ways to tell our stories." Félix & Paul Studios were comissioned for an Introduction to Virtual Reality cinematic experience to help launch the Samsung Gear VR. 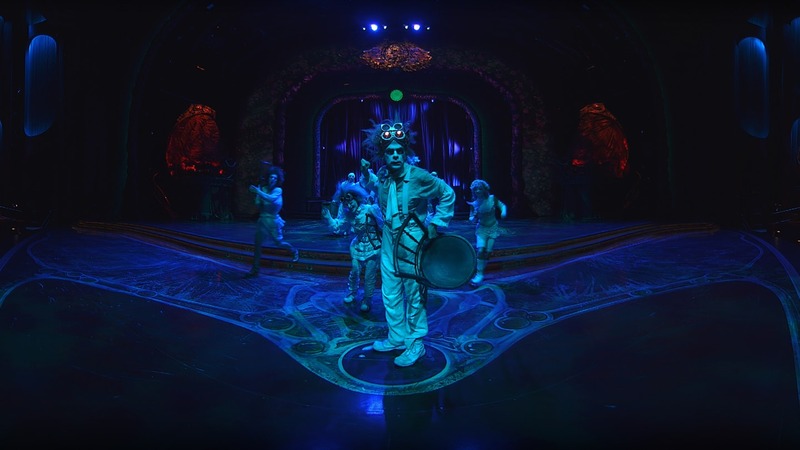 The team used their propriety stereoscopic 360° capture technology to put users in the center of a Cirque du Soleil performance. 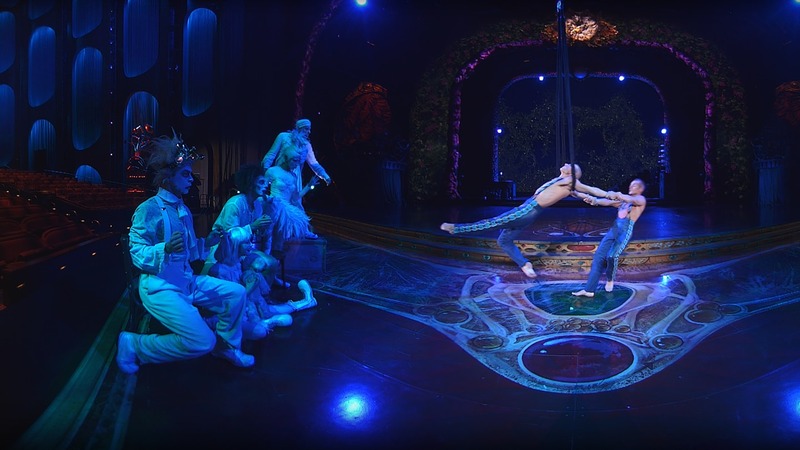 For the Cirque du Soleil performance, Félix & Paul directed a special aerial strap performance specially designed for Virtual Reality where the viewer is on stage within the world of ZARKANA. 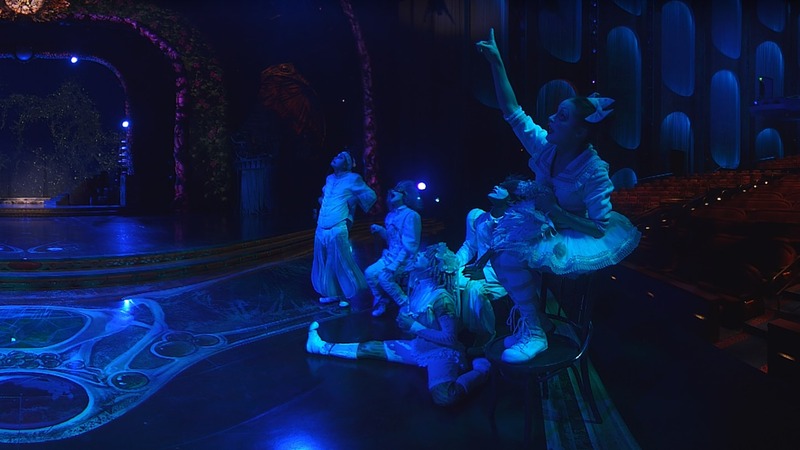 The entire production process took three weeks and the title also makes use of positional audio to guide the viewer where to look at key moments. 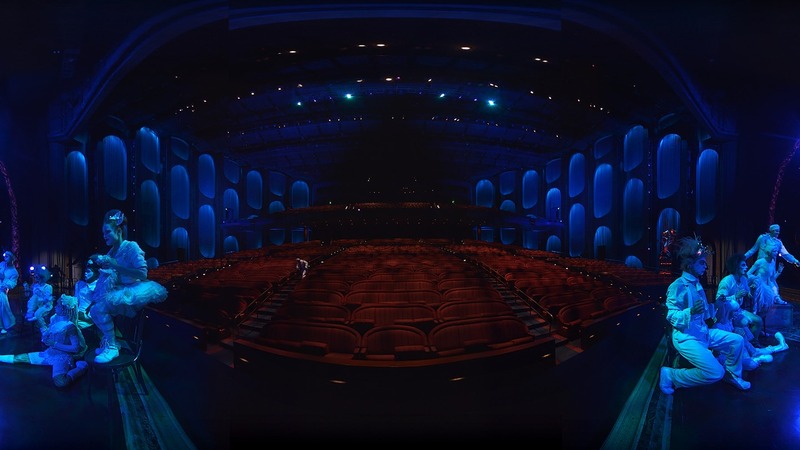 Whether it be the grandiose moments, such as incredible contortionists performing atop a giant mechanical hand, or more intimate ones like a performer adorned with concentric rings moving about the stage like a robot, there's something to see in every direction of this unique ten-minute virtual reality experience. 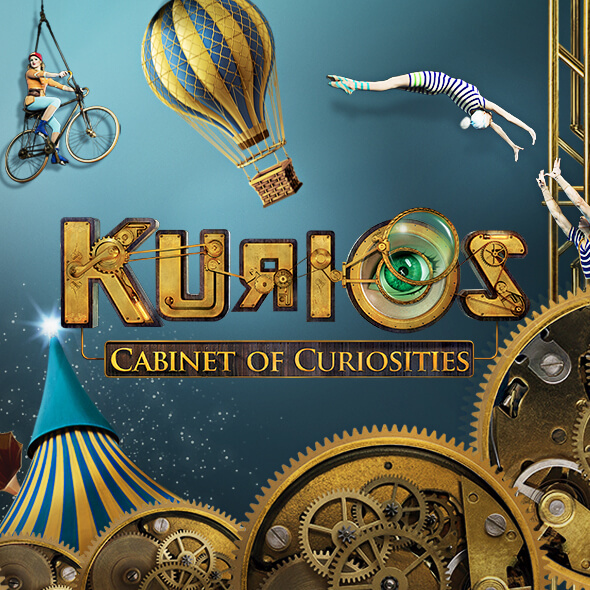 Just like the theatrical version of KURIOS, Inside the Boxof Kurios transports the viewer into the curio cabinet of an ambitious inventor who defies the laws of time, space and dimension in order to reinvent everything around him. 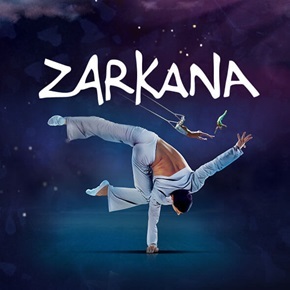 The virtual reality version allows anyone with a Samsung Gear VR and compatible Samsung smartphone to immerse themselves in a world that is an ingenious blend of unusual curiosity acts and stunning acrobatic prowess, showing that anything is possible through the power of imagination. 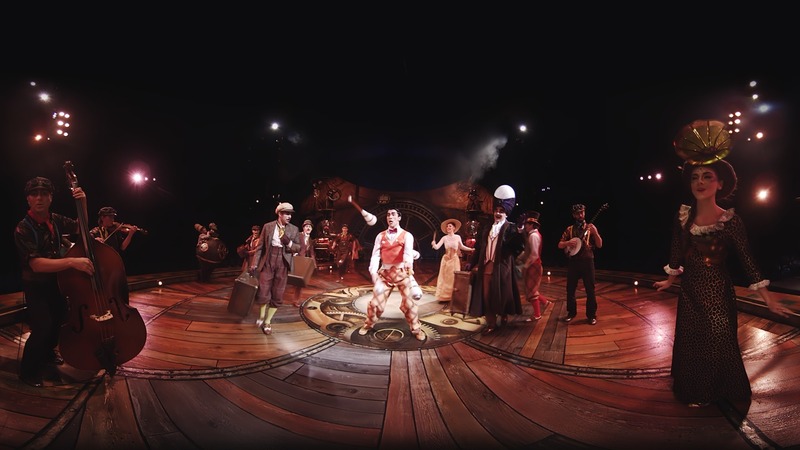 "For this virtual reality experience, we want[ed] to take our audience of one on a journey that's really unique, emotionally vibrant, and filled with moments of humor, surreal wonder and fantasy," said Félix Lajeunesse and Paul Raphaël, co-founders of Félix & Paul Studios, who co-directed this experience with Michel Laprise, director of the theatrical version of Kurios. 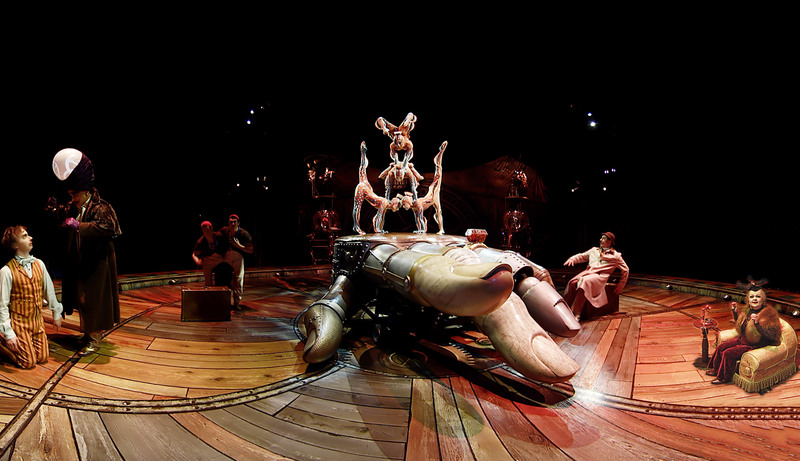 But make no mistake, Inside the Box of Kurios is not a watered-down afterthought; the experience makes use of 35 of the troop's performers in full costume and makeup. 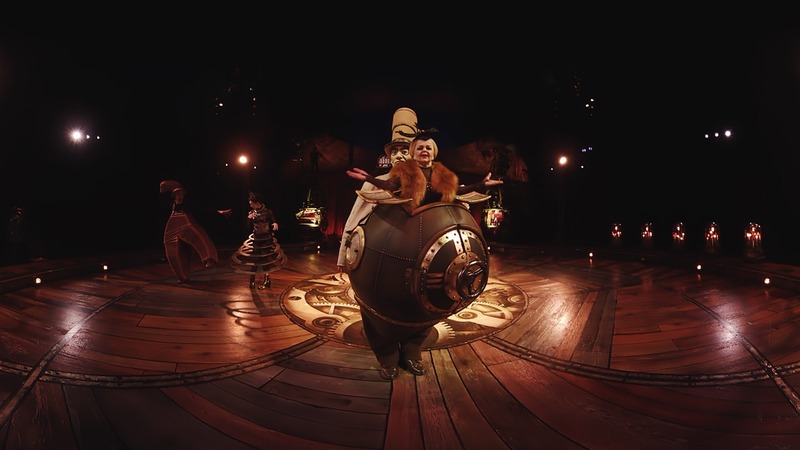 Cirque du Soleil Media Producer André Lauzon said that they didn't just plop a VR camera down on stage during a rehearsal of the usual stage performance. 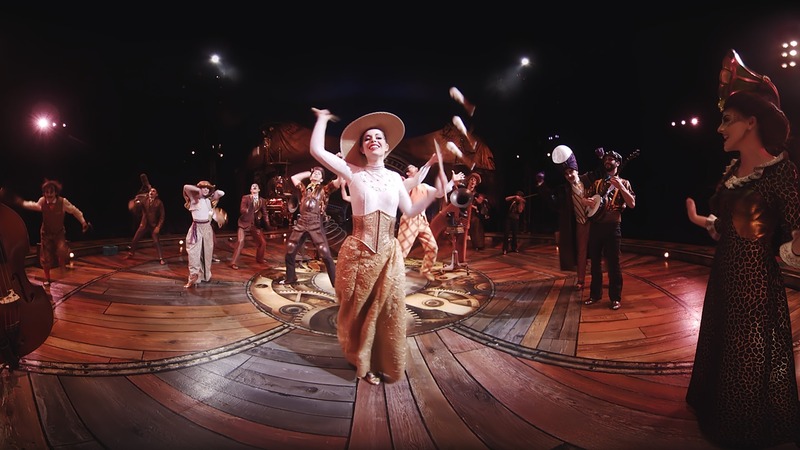 "We completely recreated the choreography to adapt it to VR. Adding and modifying acts as well," Lauzon said. "For instance, the box sequence (featuring a large wooden crate with characters pulling away boards and peering inside) is completely new, just for VR. 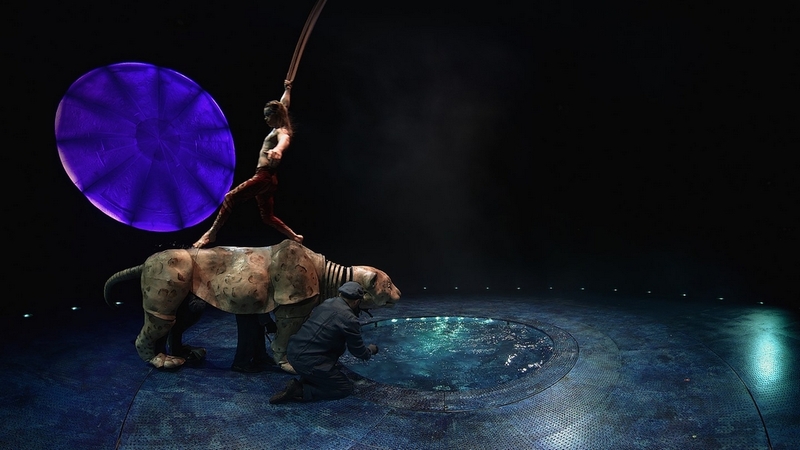 Going from an audience of a couple of thousands to an audience of one... [we adapted] the language of the circus to the language of virtual reality." Lauzon adds that the experience’s longest segment, captured as a single shot with no edits, is a whopping eight minutes. Quite an impressive feat given that the production eschewed the tools of standard filmmaking - like cuts, camera changes, and camera movement. 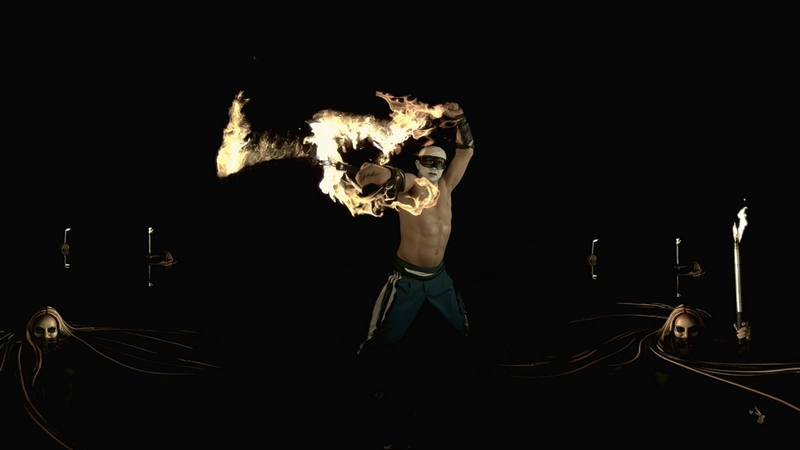 Enter the world of KÀ The Battle Within, a virtual reality epic adventure of heroism and martial arts. 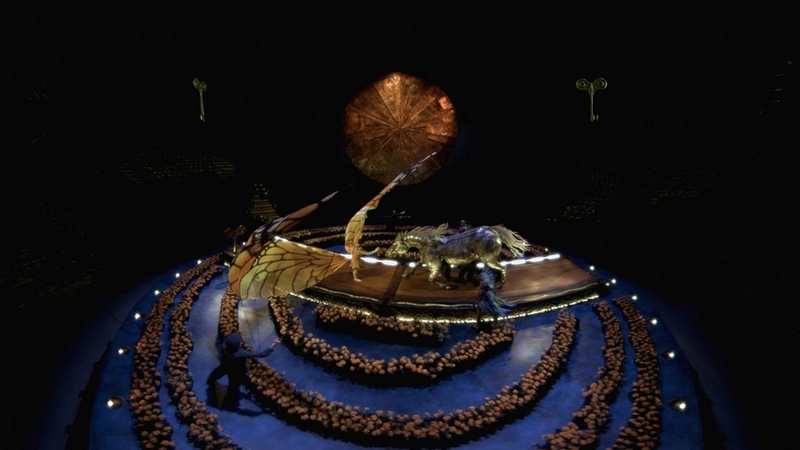 Two rival clans from an ancient and mythical world confront one another in a furious clash of vertiginous acrobatics and breathtaking combat. The very fabric of reality is transcended, as the physical world is broken into horizontal and vertical choreographies. 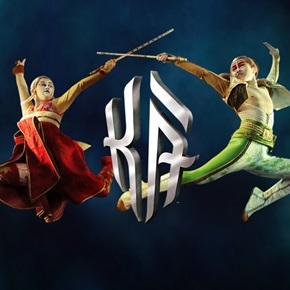 KÀ The Battle Within pushes the narrative and experiential boundaries of the universe of KÀ, the colossal theatrical production by Cirque du Soleil, to epic new heights. 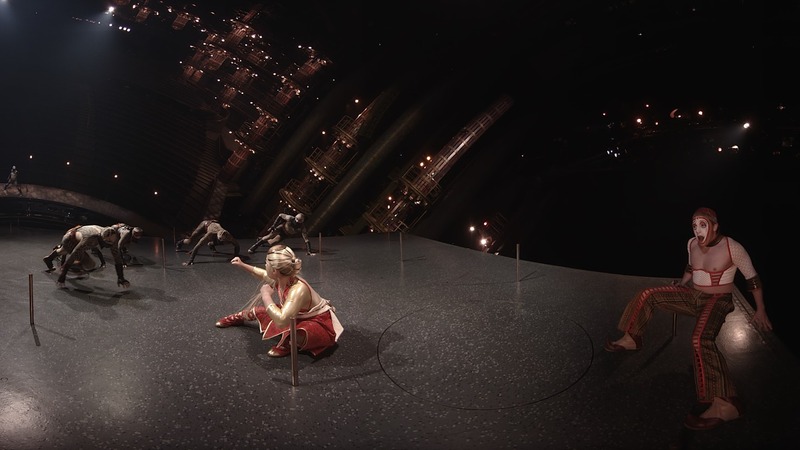 Imagine dropping into a trippy, Cirque du Soleil universe, where everything seems tilted on its side. Literally. This 13-minute short plunges viewers into the show's huge martial-arts battle, where you're not just a fly on the wall... you're in the middle of the mêlée! Characters look, leer, threaten, or even smile encouragingly as you're brought into the uphill flight from the marauding hordes. 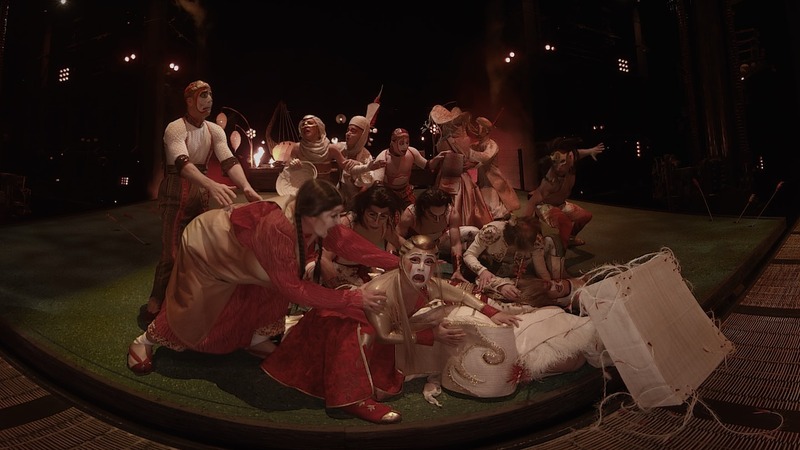 The scenes that play out here are recognizable from the stage production but reworked to place the user at their core, impressing with the intensity on the artists' close-ups. 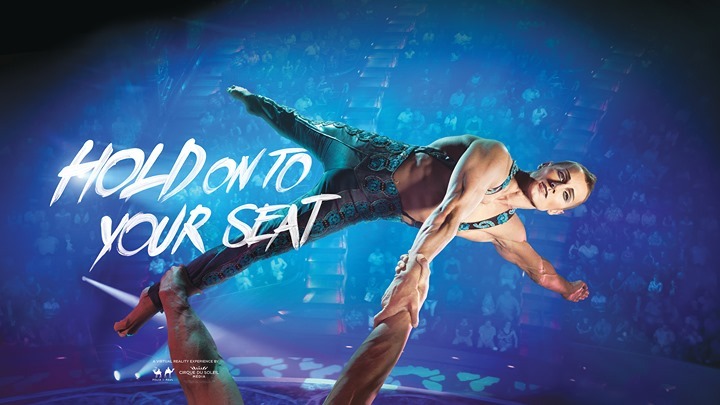 Flinch, peer and cringe as the simulated eye-contact might get your own facial muscles twitching especially in the climax on the large platform that slowly tilts you to a nearly 90-degree angle, acrobatic performers flinging themselves around and behind you! "The experience marks a step forward in the sense that you are in constant motion," said Felix Lajeunesse. "You are moving through the space, embracing it in a zero-gravity way." Virtual reality, an immersive technology that puts a viewer in the middle of the action, is an entirely new entertainment format. For filmmakers, that offers new opportunities to transport their audience into their stories and let them play a role. 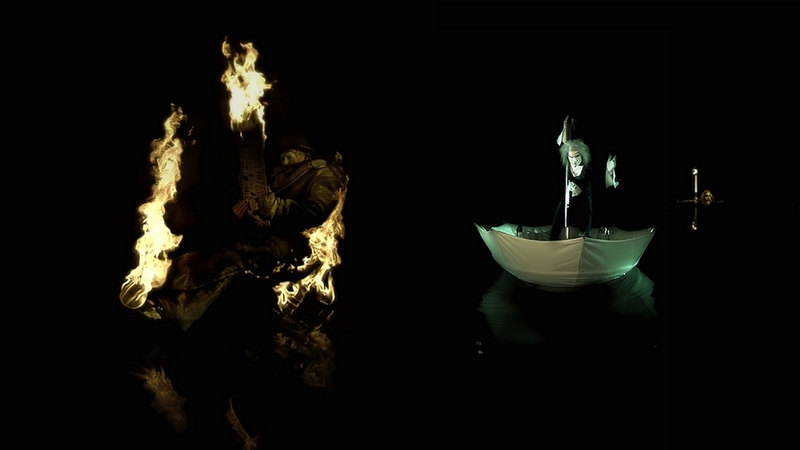 But it also raises challenges: How do you shoot a film when there's no "off-screen" area to put the lights and the crew? How do you get the viewer to look in the right direction where all the action is taking place? Most importantly for "Ka," how do you tilt the viewer on a gigantic moving platform without making them feel sick? Lajeunesse said Felix & Paul and its co-director François Blouin built the experience to begin with smooth, linear movements constantly through the film. It begins with tracking shots that move the camera -- and the viewer -- forward, left-to-right and down-to-up. "You get used to it as a viewer, your mind gets trained to...the physical changes," Lajeunesse said. 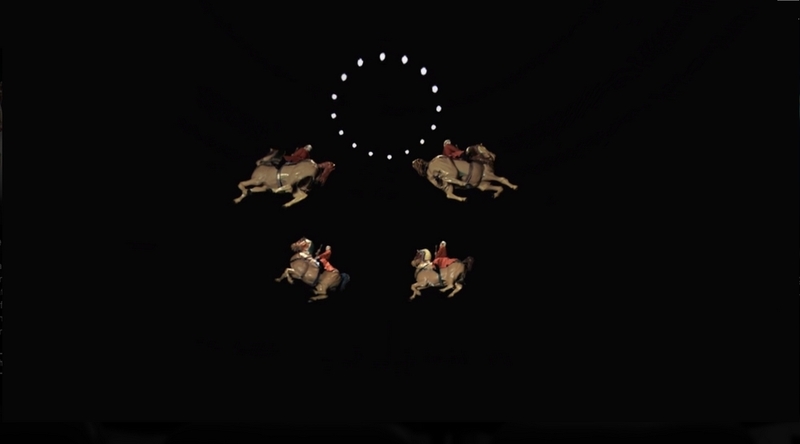 "Then we go for the very epic moments of transporting the viewer through space. 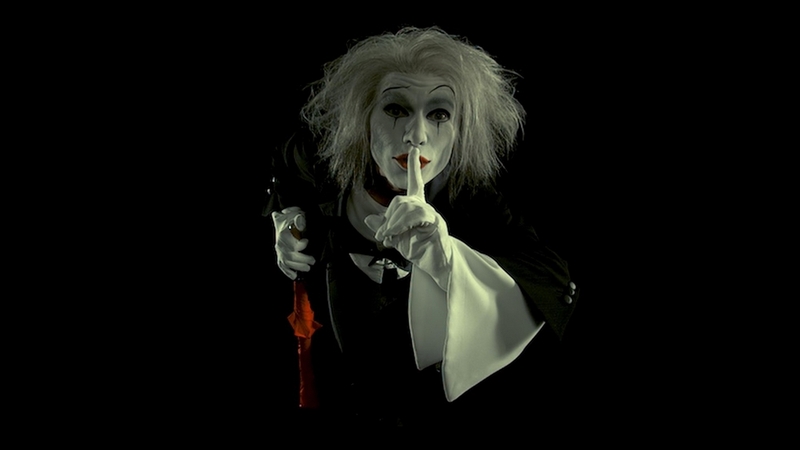 It wouldn't have worked if we had started the experience that way." 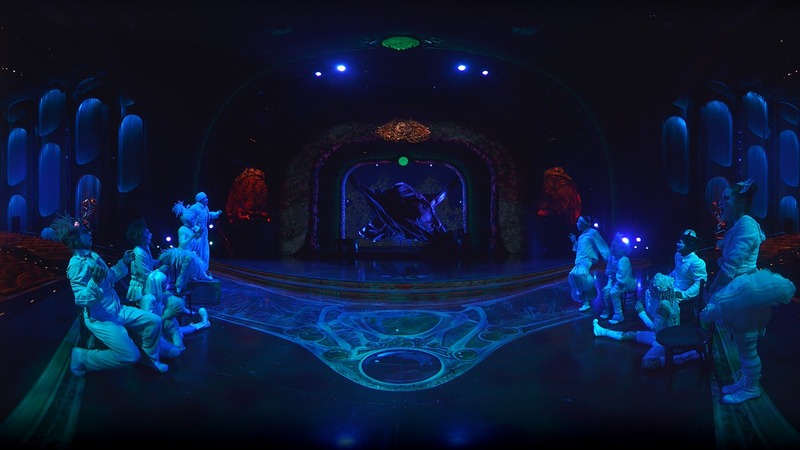 The 12-minute 360 degree, 3D experience literally submerges the user into an abridged version of Cirque du Soleil’s live show "O", delving deep into the world of surreal underwater performance art with its aerial acrobatics, dives, fire, and hauntingly beautiful amphibious characters. 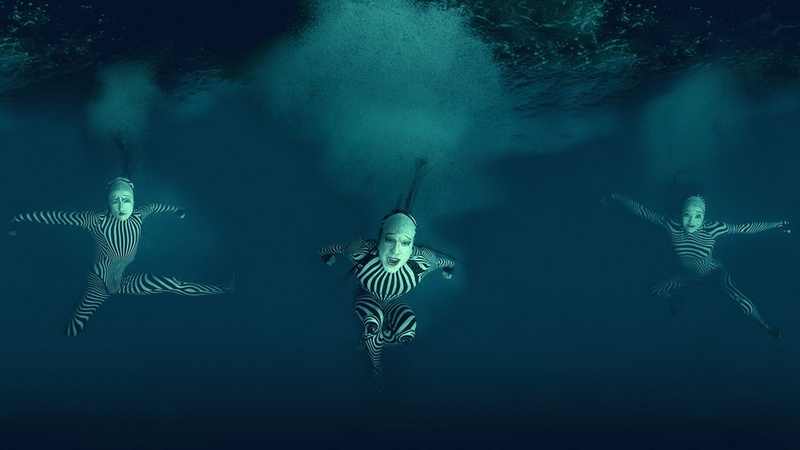 DREAMS OF “O” is the first-ever VR experience to combine simultaneous underwater and slow-motion shooting, which required significant technical advancement to accomplish using Felix & Paul Studios’ proprietary camera technology. 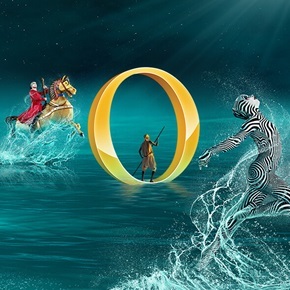 In DREAMS OF "O", the original narrative is abandoned, giving us instead a sequence of 360° encounters and images. 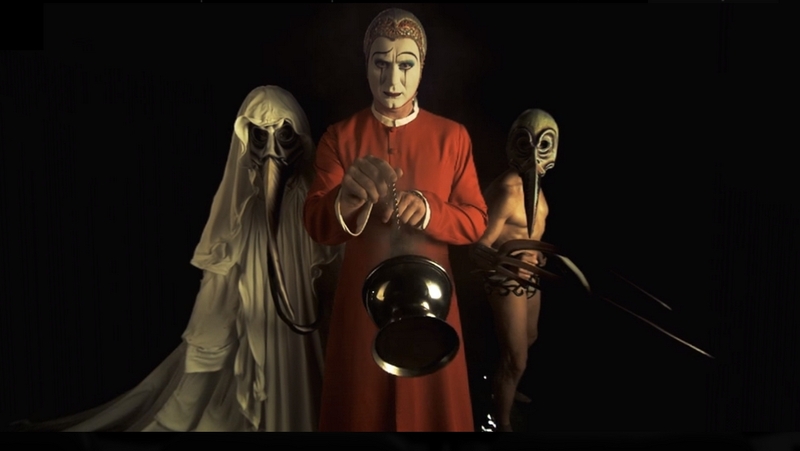 To welcome you, a white-faced Comet swings his incenses-burning thurible closer to your face, a grave benediction as your travels bring you further through the world of Cirque du Soleil’s most skin crawling experience to date. 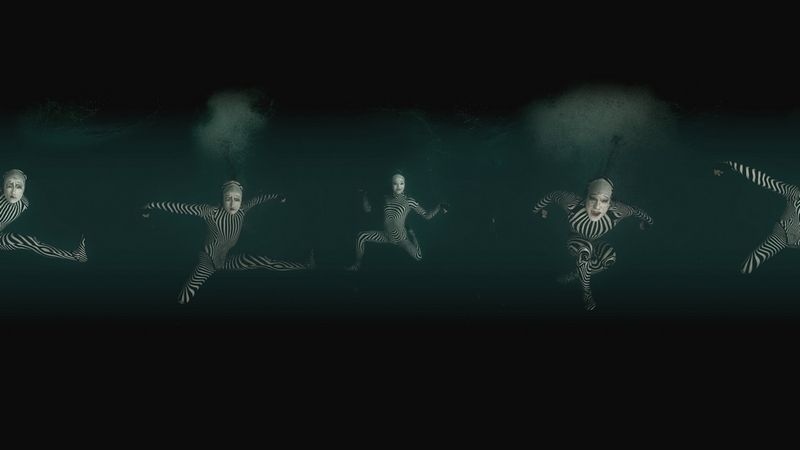 Next, we're transported beneath the surface to watch synchronized swimmers (as intriciately made-up mermaids) and plummeting divers forcefully disrupting the waters around us. Or, we are semi-submerged, watching eerie women lurking just below the surface around us. Or, we're high up in the air, as divers are launched towrad us from a pair of Russian Swings before turning beneath us to shoot down into the depths below. Or, we're watching Ray Wold burn up in his lounge chair as he nonchalantly reads his newspaper. 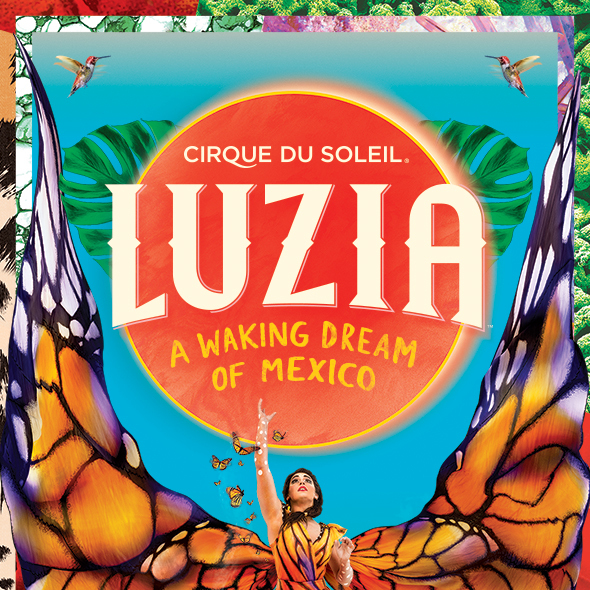 Through the Masks of LUZIA takes the audience to an imaginary Mexico, like in a waking dream, where light quenches the spirit and rain soothes the soul. 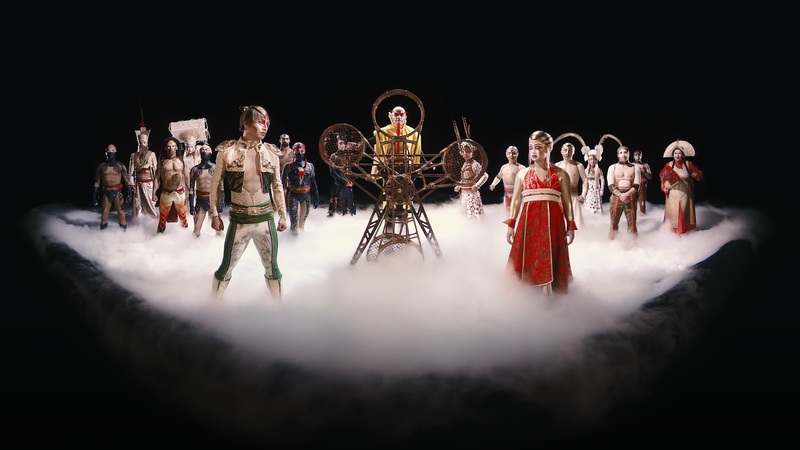 The creation is a poetic and acrobatic ode to the rich, vibrant culture of a country whose wealth stems from an extraordinary mix of influences and creative collisions. 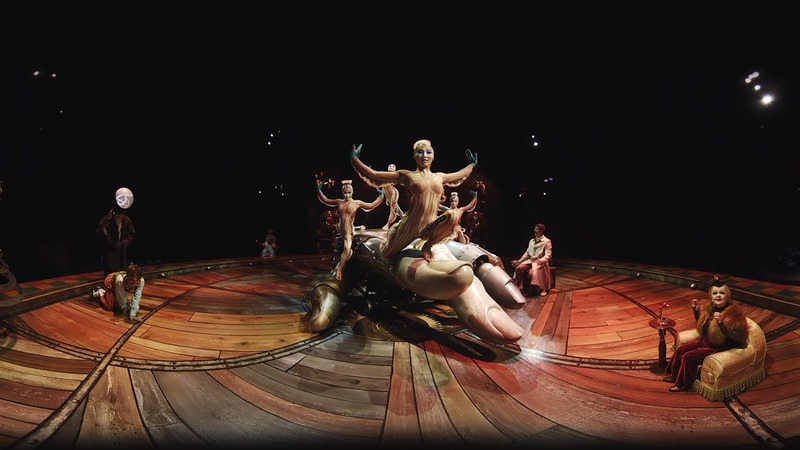 To fully benefit the VR attribute and achieve this 14-minute 3D 360° cinematic experience, the Cirque du Soleil creation teams redesigned the acrobatic performances, thus creating a completely new experience. 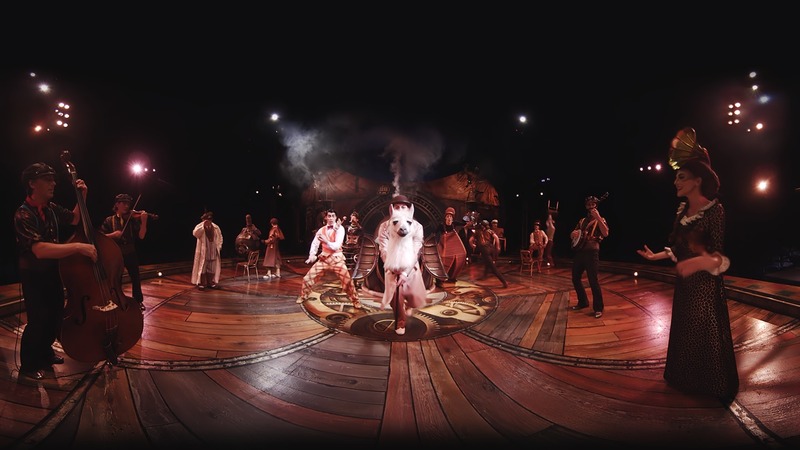 Through the Masks of LUZIA becomes the first-ever VR experience to be captured through both hyper-stereoscopy and hypo-stereoscopy processes. 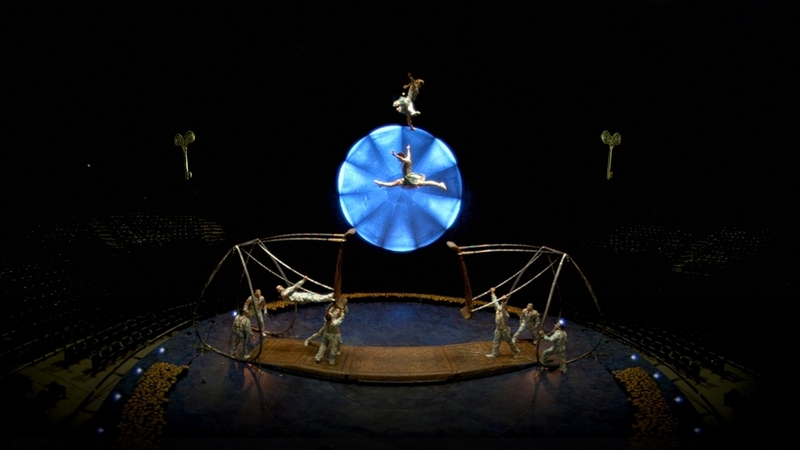 This brand new experience offers viewers an unmatched degree of immersion, even making them feel like a giant or like a miniature throughout scenes of mind-bending acrobatics and daring stunts. 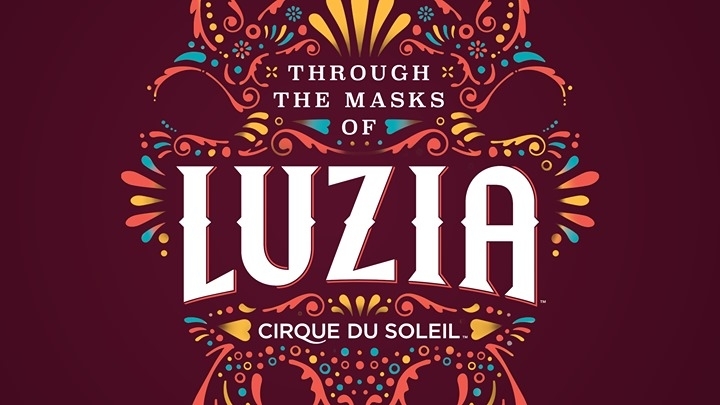 “Inspired by the simultaneously festive and surreal atmosphere of LUZIA, we created a VR-native journey through an unexpected world full of wonder and amazement, incorporating living embodiments of mythology in a landscape which is part dream, part fantasy, part reality,” said Félix Lajeunesse, co-founder and creative director at Felix & Paul Studios.